She was Betty Lou McCallum Wine and on May 20 she would have been 84. 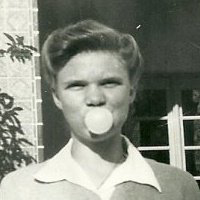 My mother loved homemade ice cream, books, Yosemite, baking, fiber arts and baseball. She was a painter, a gardener and a musician. She loved all sorts of games and would sit on the floor and play marbles with my brothers and jacks with my sisters and me. She taught us how to use a yoyo and a pogo stick, and made certain that we had it all: badminton, tether ball, basketball hoop, croquet, etc. Or maybe that was her way of getting us out of the house during those hot Riverside summers. She was an accomplished pianist and occasionally treated us with her accordion. I don’t remember her having a large repertoire, but I was mesmerized watching her fingers on the ivory keys and working the squeezebox. She would wipe off the blue marbled panel and keys and gently pack it back into its velvet-lined case. Her music appreciation extended into the latest in stereo systems. I don’t know any other women of my mother’s generation that relished sound technology, from the hi-fi, 8-track, cassettes and finally CDs. She enjoyed a broad spectrum of music, from Mario Lanza, Pat Boone, Merle Haggard, Johnny Cash, Ella Fitzgerald and Charlie Pride, to name a few. She introduced me to Michael Buble, and I introduced her to Luciano Pavarotti. Every Christmas season was punctuated by a trip to the music store for the latest Manheim Steamroller CD, which was added to her holiday collection of about 70. Mom was an Extreme Couponer before it was trendy. Always frugal, she would patiently cut coupons from the Sunday paper and womens’ magazines, spread out the grocer ads on her kitchen table, and plan her shopping day like a Parisienne, hitting her favorite grocers for the best products and prices. This was in the day when housewives knew their grocers well, and my mom was on a first-name basis the checkers at Alpha Beta. Mom made the best apple pie, banana bread, Bread and Butter pickles, strawberry and apricot jam. She scoured the Penny Saver for people selling the fruit off their trees, and dragged us along to help pick. We’d take the fruit home and sift through those with bruises and bugs that wouldn’t be worthy of the pot and begin the arduous task of peeling. Fruit and sugar bubbled and boiled and filled the house with a sweetness that can never be duplicated with store-bought jelly. My mom rarely used a thermometer, and would test the jelly with a spoon. I would beg for a taste, and usually couldn’t wait for the hot syrup to cool and would burn my tongue. When pronounced ready, the liquid would be carefully ladled into jars with a wide mouth funnel, careful not to spill onto the lip, because it would ruin the sterilized seal. I can hear her “tsk, tsk, tsk” and sigh, and carefully wipe off the jar with a hot towel when the syrup spilled. She worked very quickly and in a few hours we had a kitchen counter filled with sparkling jelly jars that looked like jewels. Mom continued making jam after her children left home and supplied my own family. When Mom passed away, her pantry was filled with about 50 jars of jelly, some as old as ten years. It was the last and most difficult cupboard to clean. Mom was an avid baseball fan. Dad worked a swing or graveyard shift, so it was Mom that drove us to Angel games. In those days tickets and concessions were cheap and we went several times in a season. My fate as a fan was sealed in September 1974 when Nolan Ryan pitched his third career no-hitter and even now, I get emotional thinking about it. If you’ve seen a no-hitter, you know the feeling. The electricity in the air at Anaheim stadium was palpable. With each whip of Ryan’s blazing fastball, fans let out a collective sigh as the umpire raised his fist signaling a strike. We held our breath with every hit that was caught. And finally, at the end of the ninth inning (without a relief pitcher) the fans erupted onto their feet and wouldn’t let Ryan go for what seemed the longest of ovations. We relived that historical day for years after. And more recently when I met Hall of Famer Jim Palmer, my first thought was I can’t wait to tell Mom. The cliché “You could write a book about her” certainly applies to Mom. She was a complicated woman and the first 40 years of my life we had a typical intricately woven mother-daughter relationship with some bittersweet memories. The rod was rarely spared, and I used to joke that I had to stand at least an arms-length from her for fear of having a slap land across my face, should I “smart-off”. Twice in my life we had gone for weeks without speaking. I had dug in my heels and taken a stand (which is now of no consequence), and she retreated until I begged forgiveness. We used to say that no one could out-stubborn my mom. But I was able to do it twice, and now I take no pleasure in it. Being the youngest of five AND a twin meant sharing and rarely having one-on-one quality time with her. When my brother and I came along, I think she was at times too tired to parent. I suppose everyone has some regrets about their childhood, but there came that flash of an epiphany when I stopped seeing her one-dimensionally, but as the tomboy who married for love, a woman with dreams, and a mother who did the best she could. My mother was the keeper of my memories, my triumphs, my losses, the scrapbook for all my enthusiasms. She validated and shamed, and now that she’s gone I am an orphan. She passed away napping in her favorite chair, a pile of coupons and bowl of ice cream beside her.